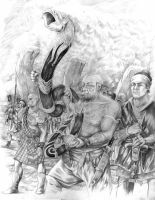 I must say Mr Papakhian that it was this image - along with your representation of The Battle of the Trident - that first drew me to your artwork (no pun intended! 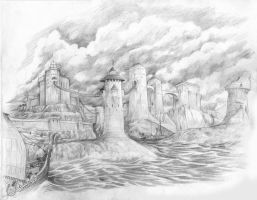 ); it remains an incredibly vivid image and really helps to sell Westeros as a perfect setting for Classic Costume Drama (I must admit here that some of my favourite artistic interpretations of The Seven Kingdoms are those that fool you into thinking it's a civil society, due to the fact that it REALLY isn't - especially during the events depicted in the Novels). If I might be so bold as to ask, were you invited to provide illustrations for the (hopefully!) 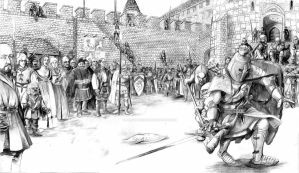 forthcoming 'World of Ice and Fire' sourcebook? (I would hate to think that such a fascinating-sounding book would be absent the enrichment contributed by your most excellent artwork!). That's very good picture! Many details and nice colors. I am also interested why you use armor of beginning of 15th century from Europe? Why this particular period? I am asking because according to the book knights had more plate armor and that should be more like the Gothic armor of the end of the 15th century. Actually, from what I've read of Martin's vision, even the 15th century was a bit advanced for him. 13th and 14th centuries were closer to what he imagined. My view is not to focus on any period, I personally love the high renaissance, particularly italian armor. I wanted to show advanced armour on the lords in my artwork, but use older forms for the various lesser lords and knights and hodge podge of styles for the men at arms. This would reflect a more fluent use of armour, not fixed to any period. Hmmm interesting position. Please understand that I am not criticizing anything, I am just interested in your views. 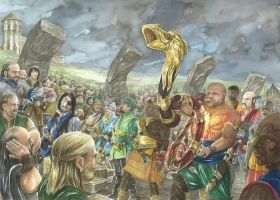 Why I like Tolkien art is because it is different in way many things from any medieval fashion we know. There are some resemblance to certain historical periods and countries, but all in all his ideas and details are original. My desire would be to see more original ideas about Ice and Fire as well. Martin didn't go too much into details on armor, fashions and styles. So it gives a huge field of imagination to those who would like to take such a challenge. In any case - keep up the good work. If you have more I'd love to see it. Me myself - I just do photography of buildings and nature and don't do drawings, but I love fantasy art in general. He describes himself riding into the throne room to Robert in Chap. 12 of agot. I double checked just to make sure. He says specifically that he was mounted as he rode the length of the hall. I sometimes make mistakes about getting a scene right, but this was pretty vivid. I agree. There aren't a lot of images, yet. This will change as the second season hits the screen and more people become aware. There are some very talented artists taking on the challenge. Komarck and Naismith come to mind right away. Tolkien's work has been around for decades and so has worked it's way into people's imaginations. Time will tell! Your skill at armor/barding and.. bricks.. makes me want to cry. Lovely job. Perfect. I love the very authentic armor styles and the different sides and their appearances. Wow awesome Very good composition ^^. 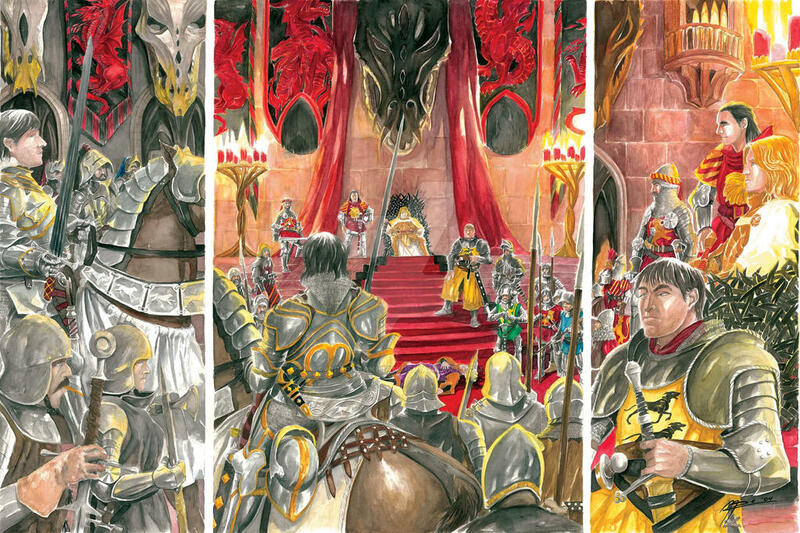 @AbePapakhain: It's Jaime Lannister on the throne os the other two should be Ned Stark and Robert Baratheon. Just got Robert wrong. That's a young Gregor Clegane. I placed him that way to symbolize the Lannister foundation. Ned beat Robert to the capitol. It is so kewl wen sumone does a scene from the book. This is truly amazing. Wow! That looks amazing. Just Gorgeous! Ah and is that the young brat king who's name I never recall at the throne? The one who was to marry Sansa? mmm, who's at the throne? Have you read a Game of Thrones?